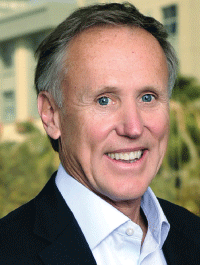 LODGING recently sat down with Bob Olson, founder and CEO of R.D. Olson Development, to discuss his company’s bold investments. What is R.D. Olson’s overall growth strategy? First of all, we look for markets that have multiple demand generators and different categories—for instance, a mix of leisure and business—so that you’re not over dependent on any one segment. Second, we want to make sure we’re developing in a market that isn’t either already overbuilt or about to be overbuilt. Once we’ve decided it’s a market we’re interested in and we have a site, then it’s really about bringing to the market what’s missing. Whether that is an extended-stay, a lifestyle, a boutique, or a branded full-service hotel, it really matters on what the market needs. If you look at each of our hotels we have, either opened or under construction, you would see all of those factors playing into every deal. What is the common denominator between hotels you develop? Every hotel we do, you’ll see the same common theme. We are connecting with the community through the design of the exterior of the building, the interior design, the art, the photos, the outdoor spaces—everything feels as though it’s part of where the hotel is located. So when you walk through or stay in our Residence Inn in Pasadena, you feel connected to Pasadena. We’ve got great historic photos of the architecture and some of the famous buildings, and our architecture ties in with Old Town Pasadena, so you really feel connected and part of what’s happening. We just opened a Residence Inn hotel in Wailea, Maui, with Hawaiian design architecture and plantation-style roofs, and Hawaiian pattern art and architecture in the interior. We have a bar with a great pool and beautiful views of the island of Lanai, the ocean, and West Maui, so it really sets you in the place. You know you are in Hawaii, on Maui, in Wailea. Do you always look to high RevPAR markets? That’s a very important part, absolutely. These are expensive buildings. To be able to deliver that product, you’ve got to have the RevPAR, and you’ve got to have the income to pay for it. And when the market is there, guests will pay for it. Should developers proceed with caution as the industry nears the peak of the cycle? I think it’s a good time to be incredibly diligent and careful. For us, if we’re going to start construction, it’s about how comfortable are we owning this hotel through the next downturn, which could happen literally any time. Every decision for every deal—a go or no go—really has to pass the litmus test: Is this the right product for this market, and are we willing to own it long term? If we aren’t, we will not pull the trigger. We can’t predict a recession, but we can be prepared for it. Is oversupply a major concern? There are markets that are being overbuilt, and we’re staying away, because we’ve seen that play out before. The new hotels will typically do better than the old, but when there is so much product coming in, I think over the course of the next two years, we’re going to hear more stories of markets being overbuilt. Cross our fingers, we think we’re not in any of those markets as we stand here today. Are you also dealing with rising construction costs? Construction costs are rising because the demand is so high, in so many different types of buildings in construction. Multifamily is doing incredibly well—you’ve got a lot of high-rise concrete multifamily buildings, wood frame buildings, and all different types of construction that are right down the alley in competing with hotels for construction, so the costs are difficult to manage. Having our own construction arm certainly helps mitigate that, but not entirely. What other challenges do developers face today? The entitlement process is just so incredibly difficult to get through, and being able to get a hotel approved. Most of the issues that arise are legitimate concerns, and we do a very good job of dealing with that, but there are a few stakeholders in some areas where it’s just about holding projects hostage, and it’s sad. We’ve been fortunate to work our way through it, but we see a lot of projects getting held up for many, many years through the litigation process, especially in the state of California, where it’s very easy to file a lawsuit against a project and hold it up. Is it harder to get a hotel deal financed in 2016? At the beginning of this year, the additional Dodd-Frank rules kicked in to where lenders have to set aside more capital for new construction loans, and so lenders are turning the spigot down. What we’re finding is that our existing relationships are what’s really getting the hotels done, so we’re fortunate to have relationships with lenders who see us as a good bet as qualified, knowledgeable hotel developers. But I know they are not taking new business, and only working with their existing client base. I think it will help dampen the potential for oversupply not in just hotels, but every product type. How do you cater to guests’ changing tastes? We hear a lot about trying to deliver hotels for millennials or Gen X, but consumer tastes across the board are changing at a fast pace and will continue to change. If I asked a baby boomer, ‘How have your travel expectations changed in the last 10 years,’ it is a complete transformation. So we need to be cognizant as we build and deliver hotels for the market—they have to be adaptable. If you build a box that can’t change and adapt, you will be a dinosaur before you know it.